Your spider is Steatoda nobilis, the so-called 'noble false widow', the spider which the media make such an unjustified fuss about. It has been frequent in the southern coastal counties of England for a great many years, without causing any problems. It is nowadays frequent and abundant in many areas of southern England, including the London and Essex area. The media frenzy caused by this spider is unwarranted. There are a number of other 'false widows' in Britain, some which are native or have been in the country for centuries, so there is a lot of misinformation about these spiders. Steatoda nobilis spiders are unobtrusive, have no interest in attacking humans and would only bite if they were put into a position where they do so as a defensive reaction. Honey bees and social wasps pose a far greater risk. 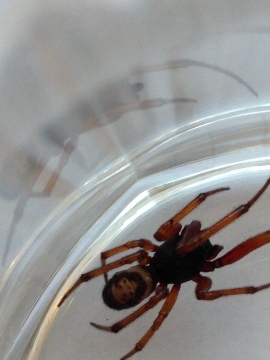 You can see more information at False Widow Spiders and the summary page. 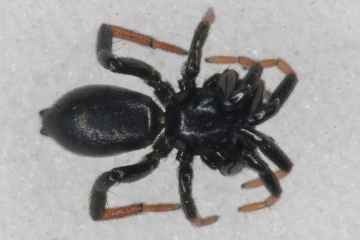 It is never going to be safe to record a juvenile Drassyllus to species level, in common with many other spider taxa where microscopical examination of the adult epigyne or male palp are required. I collected this immature female Drassyllus species from a grass litter pile at Roman Wood, Norfolk (TG407105) on 20/12/2016. The tarsi and metatarsi are strikingly pale but the epigyne is not fully developed so I can't double check which species it is. I suspect that it's Drassyllus pusillus as I can't find images of other species that show such marked leg coloration. Is it safe to record it as Drassyllus pusillus, or should it go down as Drassyllus sp? Yes please, certainly as a Meta species. Habitat also supports this. Thanks for that; she was found in the hollow of a long-undisturbed roll of vinyl flooring stored outside, damp and completely shady, so the habitat sounds consistent. Should I edit the photo captions to suggest Meta manardi? This is not a Steatoda species. It appears most likely to be one of the cave spiders Meta species, probably Meta menardi. This specimen was photographed on 30 August 2016 at EX36 4JJ ~ Alswear, South Molton, North Devon. 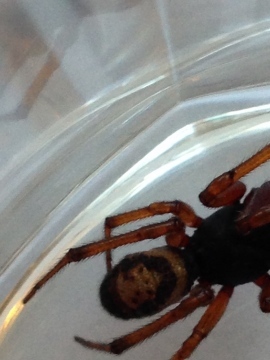 We think it's Steatoda nobilis, but not very confidently.